This HTC Desire 500 LCD screen assembly includes the LCD, digitizer touch screen and front glass already attached. 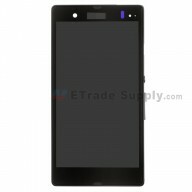 This HTC Desire 500 screen replacement is the Black one and has logo on it. This Desire 500 screen assembly is 100% OEM manufactured and assembled. This part is only compatible with the HTC Desire 500. Please check your model before purchasing. These parts are hermetically attached. Special tooling and skills are required for replacing this HTC Desire 500 LCD screen assembly. The flex cable of this Desire 500 screen replacement is fragile and easily damaged. Please handle carefully during replacement. First time to replace my phone and went smoothly, screen works well and touch sensitivity is great! changed my HTC Desire 500 screen,totally works very well, thanks for the great product!